Is Your Dog Food Missing These Vitamins? For humans, it is imperative to find the right balance of the necessary vitamins and minerals in your diet. A vitamin deficiency can cause several health problems. Likewise, too much of any one vitamin can cause other problems. The same holds true for your dog. Choosing a high quality pet food is one of the most important decisions that you’ll make as a pet parent. You likely check the ingredient list to make sure there’s enough lean protein, and not too many grains or fillers. But do you check to see if it contains the must-have vitamins? A lack of vitamins, or overload, can cause skin, coat, muscle and bone issues, as well as many other issues. When shopping for your pet’s next bag of food, be sure to look for these vital vitamins. Which Vitamins Should Be Included in My Dog’s Food? Vitamins A and E — Both are antioxidants that can help your dog manage its weight and live a healthy life. They also help to improve your dog’s immune system and aid in the aging process. Dog food that contains eggs may contain sufficient quantities of vitamins A and E.
Vitamin C — Just like you might drink a glass of orange juice so the Vitamin C can boost your immune system and help you feel better; your dog requires the same vitamin for similar reasons. Vitamin D — Helps your dog stay active by supporting it’s bones, helping to keep them strong and healthy. It also promotes dental health. Vitamin B-12 — Helps your dog live a long and healthy life because it promotes healthy cell development in your pet. 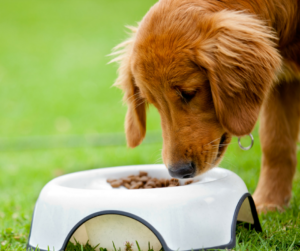 B vitamins are some of the most important vitamins for your dog’s diet. But which are necessary for great canine health? The B-complex is a series of vitamins that are vital to your dog’s health. They are water-soluble and are constantly being flushed from your dog’s system. As a result, it is very important that your dog replenishes the levels of B vitamins in his body. The B-complex includes thiamine (B1), riboflavin (B2), niacin (B3), pantothenic acid (B5), pyridoxine (B6) and Vitamin B12. Combined, these vitamins help to enhance the function of nearly every part of the body. This is why pet parents should make an effort to include all B vitamins in their dog’s diet. Some signs that your dog may be dealing with a B-complex deficiency are a lack of appetite, decreased energy, digestive issues or unexplained weight loss. Increased thirst and increased urination can also be signs of a deficiency. Pet owners should note that some B vitamins require the support of other vitamins in order to function and absorb properly. Finding food products and dog supplement products with all of these beneficial vitamins is essential. Essential for a healthy metabolism, and can help control your dog’s weight. Help to boost the function of the central nervous system in dogs. Niacin, also known as B3, allows the nervous system to properly grow and develop. B5 allows carbohydrates, proteins and fats to release the proper amount of energy, helping your pet to feel revitalized. It also aids in the absorption and utilization of other vitamins, as well as the formation of antibodies. Help improve fertility in dogs. B12 is essential for reproductive health. The most reliable way to ensure that your best friend gets the right balance of vitamins and nutrients in his diet is to feed a high quality food each day and avoid table scraps and people food. However, B vitamins can also be found naturally in the fruits and vegetables that you may give your dog as a treat. While it’s essential that you feed your dog a nutritious pet food filled with the best vitamins, your dog may still not be getting everything that it needs. The best way to fill in the nutritional gaps in your dog’s diet is to add a pet nutritional supplement to its daily routine. You should also choose a dietary supplement that provides the right combination of vitamins and minerals to keep your dog healthy. One of the best supplements on the market is NuVet Plus. NuVet Plus contains a synergistic blend of human-grade ingredients that benefit canine health. Vitamins B-1, B-2, B-3, B-5, B-6 and B-12 are combined with several other vitamins and minerals to deliver superior nutrition to your dog with each dose. This product is formulated specifically to meet the nutritional requirements of dogs, and contains all of the best ingredients that are designed to work together in order to enhance your pet’s health. NuVet Plus provides your dog with an additional boost of antioxidants, vitamins and minerals that will help to strengthen its immune system and improve its energy levels. In order to find out first-hand how beneficial NuVet Plus can be, be sure to check out NuVet Labs on Twitter.